Next day, January 10, we moved on, northbound,after saying goodbye to everyone, and handing out email addresses. We didnt get far, driving along the Mendocino coast, we saw so many nice little spots, the van still seemed to have a problem with the exhaust, so Bert decided to camp in a very nice place, at Manchester beach, a KOA, but very spacious , with beautiful big pine trees, bordering on fields, good spot to linger a while…..
Robins were singing here, in January!!!! 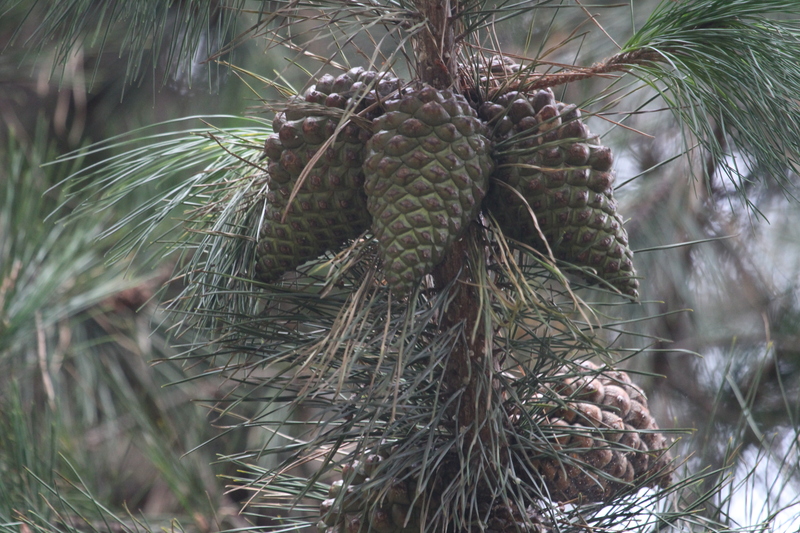 The pines are Monterey pine and Bishop pine, the cones grow on the main branches, they are heavy and very solid, they dont drop but open up once the sun gets warm, scattering their seeds here and there. Monterey pine cones, they stay on the tree for years without opening. started making a huge racket, snapping open with a bang!!! First time this happened, i thought something was dreadfully wrong in the boat, somewhere, you just can never know, but it was the cone, snapping open its scales, and the seeds were ready to come out, i have collected them all, will try to grow one into a small bonsai! The smaller cone is much slower to react, but two scales are open now.